Instead of competing against the likes of Yankees slugger Aaron Judge, Red Sox pitching ace Chris Sale or Astros sparkplug Jose Altuve, Harding is attempting to go yard against open-wheel powerhouses Team Penske, Chip Ganassi Racing and Andretti Autosport. So let’s check the scoreboard heading into Sunday’s 102nd edition of the Indianapolis 500, Race No. 5 on the 2018 schedule. Roger Penske’s organization is the most successful in open-wheel racing, having scored 200 wins in 1,660 starts, including a record 16 at Indianapolis Motor Speedway. Chip Ganassi Racing has 103 wins in 1,172 starts and four Indy 500 victories. And Andretti Autosport has 58 wins in 981 starts, five Indy 500 championships, including the last two for team-owner Michael Andretti. Enter hometown entrepreneur Mike Harding and his group, which made its series debut with Gabby Chaves’ respectable, lead-lap/ninth-place finish in last year’s Indy 500. Harding Racing ran a limited/cash strapped three-race schedule in 2017, highlighted by Chaves’ fifth-place finish on Texas Motor Speedway’s 1.5-mile oval in Fort Worth last June. To that end but maybe not so fast, Barnhart has assembled a veteran staff featuring team manager Larry Curry, engineer Matt Curry and chief mechanic Brian Hornick. In addition, two-time Indy 500 champion Al Unser Jr. is on-board as Harding Racing’s executive consultant/driver coach. For instance, Harding’s first career pole position with Chaves remains somewhere down the schedule heading into Sunday’s renewal of “The Greatest Spectacle in Racing.” Chaves, who started 25th last year on IMS’ 2.5-mile oval, will roll off 22nd Sunday after a four-lap/10-mile average tour at 226.007 mph. Sunday’s 200-lapper will be Chaves’ fourth Indy 500 start. 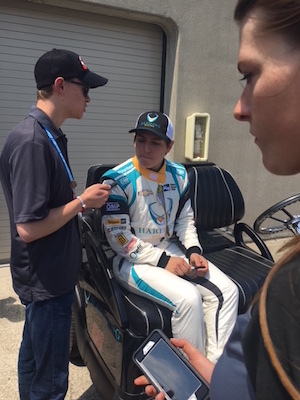 A 24-year-old native of Bogota, Colombia, Chaves earned Sunoco Rookie of the Year honors for his 16th place finish in the 2015 Indy 500 driving for Bryan Herta Autosport with Curb-Agajanian. Running the entire 16-race schedule, Chaves also earned season-long Rookie of the Year honors. Chaves finished 20th at IMS driving for Dale Coyne Racing in 2016, when he ran seven races before being replaced. Leading his first lap around IMS also remains high on Gabby’s list of resume-building talking points. car after winning the 2014 Indy Lights championship _ and the Freedom 100 at IMS _ for Belardi Auto Racing. “My second year, I learned that you don’t always have a good car. And it was very frustrating. And basically, the first 150 laps, I was just so aggravated inside the car because I felt like there was nothing I could do to show what I could do on track. Chaves’ results through this season’s first five events in the No. 88 Harding Group Chevrolet have been underwhelming. Gabby recorded his best numbers in the season-opening race on the Streets of St. Pete, where he started eighth and finished 14th. He has failed to lead a lap and has not paced a race since recording 31 laps-led in 2015. Chavez will start the Indy 500 17th in IndyCar Series driver points. Barnhart _ the left rear tire-changer on the pit crew of Unser Jr.’s 1992 Indy 500-winning car at Galles Racing _ said Chaves’ stats are not a valid measure of the young man’s skill-set. “I don’t think there’s any question of Gabby’s talent,” Barnhart said. “Being a Lights champion and Indy car Rookie of the Year, I think again it’s a little bit of a byproduct of a function of timing. He was Rookie of the Year with Herta in 2015, so in 2016 he basically sat out most of the year. Drove three races in 2017, so I think it’s getting back into the car with limited experience on the Indy car level. “He’s got less than two full seasons under his belt, and you add that to the (universal) aero kit change and a pretty significant change in the downforce levels he was running in 2015-16-17, what he was accustomed to driving is vastly different from what we have on the racetrack now. Having worked until six months ago in open-wheel’s “sanctioning body side,” Barnhart remains keenly aware of the forces affecting any first-year/start-up organization. “It’ll be a while before you consistently compete with the other teams,” Barnhart said. “It’s a challenge. There’s a number of factors that work against you, just with the economy of scale. You look at how in the effort to save money the series will reduce the length of events to two-day shows, reduce the length of the practice sessions…you’ll do a 45 or 60-minute session and the next thing is qualifying and in a one-car team, you’ve got one direction to go. Barnhart exited the sanctioning body last winter after serving as INDYCAR vice president of competition since May 2013. He previously held the position as president of operations and strategy and INDYCAR’s competition and racing operations division president. Barnhart also assumed the race director’s hot seat in January 2015, a post he previously held from 1997-2011. In his role with INDYCAR’s executive team, Barnhart worked with manufacturers, teams and venues overseeing a variety of strategic initiatives. He also oversaw the race control staff, sporting regulations of the rulebook, the Holmatro Safety Team and medical personnel, security and timing and scoring. As race director, Barnhart was responsible for management of the event including decisions on track conditions, safety dispatch and communication of all decisions made by the stewards to competitors. Barnhart had been with the Indianapolis Motor Speedway and INDYCAR since 1994, when he joined IMS as track superintendent. He served as INDYCAR’s president and chief operating officer from 2004-2007. Suffice it to say that Barnhart extinguished any number of political fires during the formative years of Tony George’s Indy Racing League and its war with the Championship Auto Racing Teams for domestic open-wheel supremacy. “It’s a little like the government. You’re trying to look out for everybody,” Barnhart said. “Every decision that you make, how’s this going to affect the teams, the costs, the suppliers, the competition, safety, television, promoters…there’s so many factors that go into your thought process when you’re on the sanctioning body. Here, every decision you make, how does it affect us? A 56-year-old native of Indianapolis, Barnhart served in various mechanical roles on Indy car race teams from 1982-1994, including Galles Racing, Penske Racing and Patrick Racing. He has worked with legendary open-wheel drivers/Indianapolis 500 champions A.J. Foyt Jr., Emerson Fittipaldi and Unser Jr. One year after Little Al edged Scott Goodyear for victory here in ’92 by 0.043-seconds _ closest finish in Indy 500 history _ Barnhart served as chief mechanic on Al Unser Sr.’s King Racing entry fielded by NHRA Top Fuel and Funny Car star Kenny Bernstein. With that background Barnhart was quick to admit his return to the “team side” has more often than not left him smiling at day’s end. “I started on the team side, loved what I did on the sanctioning body side,” Barnhart said. “And it was the right time to come back and get on the team side again…just being on the pit stand again and back on a team trying to do the best you can is kind of where I wanted to finish my career. 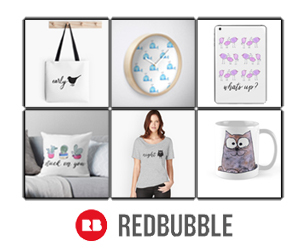 You know, you go through life in runs and this is kind of where I want to finish out what I’m doing. Chaves said he is appreciative of the accumulated knowledge he can tap into at Harding, beginning with 56-year-old Unser Jr.
Unser Jr.’s career also includes CART driving titles in 1990 with Galles-Kraco Racing and in 1994 with Team Penske. Chaves added that while team president is Barnhart’s official title it doesn’t cover his sphere of influence at Harding Racing’s shop at 1255 North Main Street in Speedway, across 16th Street from IMS. “I think where Brian really is making a difference is with our team-owner,” Chaves said. 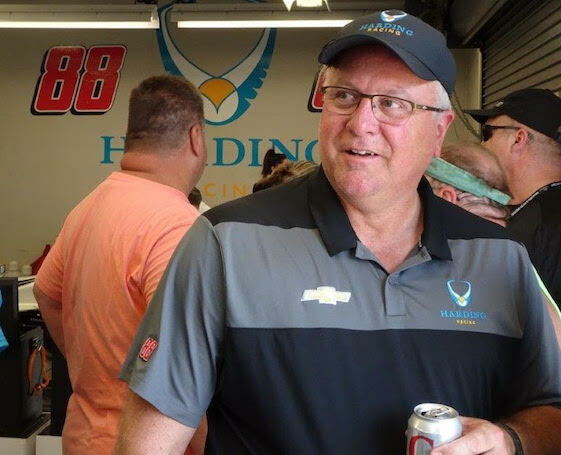 In addition to owning and managing Harding Racing, Mike Harding is owner/CEO of Indianapolis-based Harding Group, an asphalt and paving company. Under his direction, Harding Group is an official sponsor of IMS. Mike Harding has been involved with the paving industry and his father’s company, F.E. Harding, since the early 1980s. Mike Harding purchased the company from his father and now is the sole owner. Harding Group consistently ranks among the top-10 asphalt maintenance companies in the country.